If you want to do something different at your next planned party, wedding function, school corporate event then go-karts are a brilliant way to liven everybody up and get the party started. Look no further than Bizzy Bouncers. Despite our name we provide expert equipment hire such as bouncy castles, go karts, rodeo bulls, slides, marquees and much more. Give your children a day to remember and let them giggle and have fun as much as you can by hiring our go karts. We have inflatable surrounds so that the children are safe if they do ‘crash’ and we are dedicated in the safety of anyone who rides with us. Our go Karts will guarantee loads of fun for your children. Whatever the occasion, hire our go karts for the girls and boys to ride around on. They are easy to use and go just about fast enough to keep your children safe in and control. 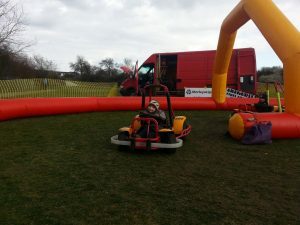 We will supply the inflatable surrounds and enough go karts for however long you would like them for and will also leave you some of our friendly members of staff to help. Our trained operators are always on hand to advise children of the age 4 to 11 how to ride before they take the wheel and we have comprehensive public liability insurance to cover you and the property; this ensures our focus on safety.